Details: Dog - Arden Grange Adult rich in Fresh Salmon and Rice Arden Grange ADULT rich in fresh salmon and rice for adult dogs is a highly digestible food specially formulated to meet the nutritional requirements of adult dogs and is especially good for dogs with sensitive skin or digestive systems. All Arden Grange products are hypoallergenic and free from wheat gluten, dairy products, beef and soya. They contain no artificial colourings, flavourings or preservatives. Feeding Arden Grange reduces the risk of dietary intolerances and allergies that can cause digestive disorders and skin complaints. 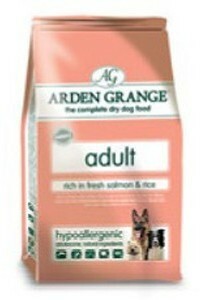 Feeding recommendations: Arden Grange ADULT rich in fresh salmon and rice is suitable for all adult dogs.